Steel solutions for budget builders. There aren't many budget builds sitting inside Lian Li cases. That's because Lian Li typically targets the high end with brushed aluminum solutions at oftentimes premium price points, though that's not the case with its new Ebonsteel series starting at $56. Lian Li says it's been hearing requests over the past several years to build more affordable alternatives, so that's what it finally did. The Ebonsteel series consists of value oriented solutions that are built with steel rather than brushed aluminum, though "they are still very much Lian Li" with features like tool-less building and grommeted panel cutouts for cable managment. "All three mid-tower cases are good choices for gamers on a budget; they offer competitive air and water cooling support, full ATX builds, and convenient building features," Lian Li says. There are three cases that comprise the new line, including the PC-K5, PC-K6, and PC-K6S. The PC-K5 supports ATX and micro ATX motherboards, has two removable drive cages that can store up to four 3.5-inch or 2.5-inch drives, and seven expansion slots. With the drive cages in place, it can accommodate graphics cards up to 250mm in length, or up to 400mm with one or both cages removed. It can also fit ATX PSUs up to 250mm in length and CPU coolers up to 160mm tall. Lian Li includes two 120mm front intake fans and a single 120mm rear exhaust fan with the PC-K5. If you'd prefer to liquid cool, you can mount up to a 240mm radiator on the top fan mounts. Finally, the front panel on the PC-K5 has two 5.25-inch bays and the top I/O panel has a USB 3.0 port, two USB 2.0 ports, and HD audio inputs. The PC-K6 is a less aggressive looking case, though no less capable. It's also able to swallow ATX and micro ATX motherboards, along with up to seven 3.5-inch or 2.5-inch drives, all of which face the panel opposite the motherboard. Graphics cards and the PSU can each be up to 310mm long, and there's room to fit a CPU cooler up to 170mm high. Cooling is further aided by two 120mm intake fans and a 120mm exhaust. Builders can install larger 140mm fans in front if they choose, and there's room up top for two more 120mm or 140mm fans. And if you plan to liquid cool, the PC-K6 can mount a 240mm or 280mm radiator. Like the PC-K5, the PC-K6 has two front 5.25-inch drive bays and the same top I/O panel amenities. The PC-K6S is the silent version of the PC-K6. It's virtually identical to the PC-K6, but with sound dampening foam inserts in the panels. It also has a hinged front panel, an extra USB 2.0 port, and a sliding metal cover to protect the front I/O. 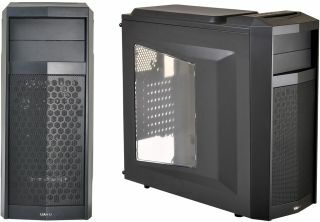 Lian Li says the PC-K5 will be available in mid-June for $56 without a window (PC-K5X) or $60 with a window ($PC-K5WX). The PC-K6 and PC-K6S will both follow in late June for $93 and $109, respectively.